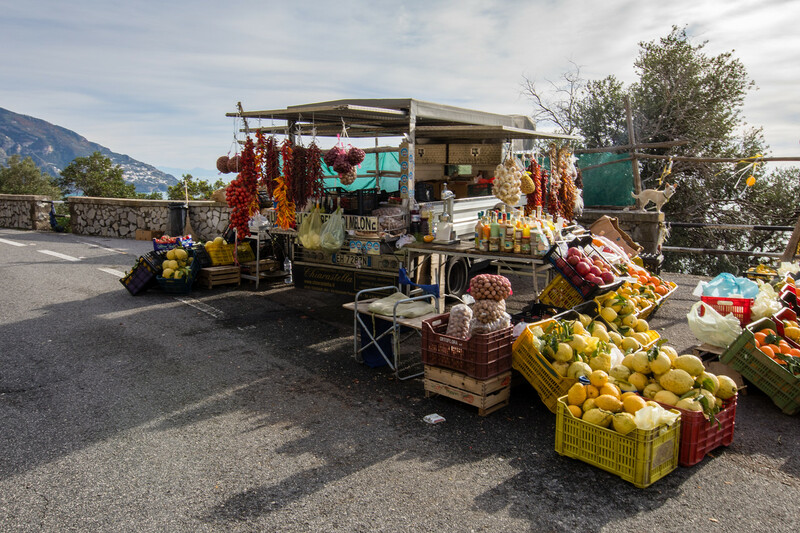 Driving the Amalfi Coast makes for a great day trip from Naples, particularly out of season when the traffic is lighter, as it’s a full day. If you get the chance to stay overnight somewhere along the way, then even better. The road is well-known for its hairpin bends, incredible cliff top views, and general scariness. I admit I’m a complete wus and had my eyes shut a lot, especially when buses come towards you, they slow down for no-one, fortunately, Jon who did the driving on the Amalfi Coast did not. However, there were plenty of places where you could pull over and just admire the scenery. Yes, even in the middle of January, we were rewarded with blue skies and incredible views. On our way, we passed several little market stalls selling the juiciest oranges and the hugest lemons we had ever seen. 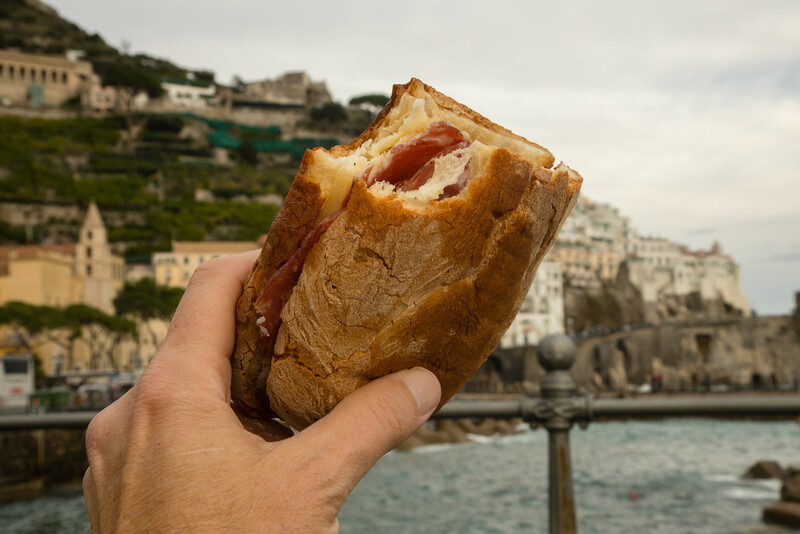 Our first stop was Positano, one of the most famous cities on the Amalfi Coast, where we pulled in for a coffee and a snack. Positano is extremely picturesque, especially looking up from the beach at all the summer houses and small hotels clinging to the cliff sides. The charming town is filled with chic boutique stores and expensive restaurants and very steep streets. No need for a gym, if staying here, just walking back to your room would be exercise enough. However, even in January, finding somewhere to park was difficult, in the end, we found a small car park for €5 an hour!! Yep, Positano is the most expensive place on the Amalfi Coast. 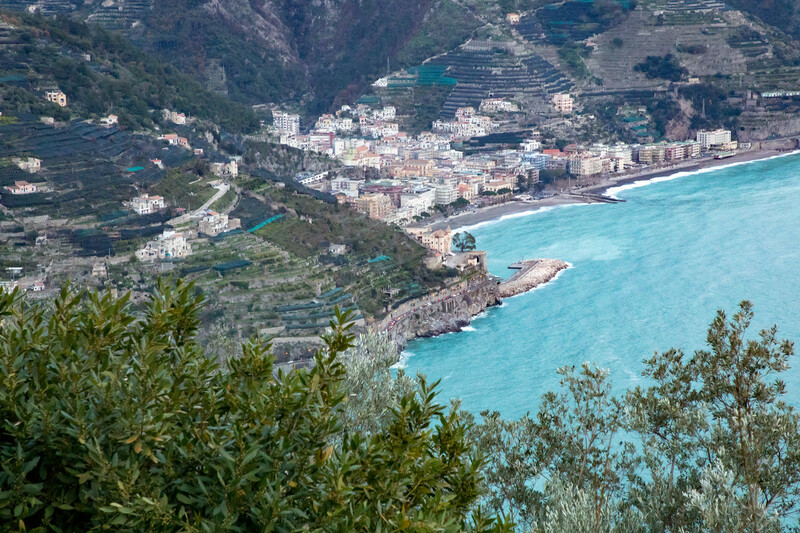 From Positano, it’s about a half hour drive to Amalfi, but we stopped a lot on the way for photos and Jon wanted me to see the views. (My eyes weren’t just closed, I was hiding underneath my jacket! I can’t swim and I’m nervous of heights, so not a great combination lol!) Amalfi was a lovely little town and much flatter than Positano. With many seafood restaurants, piazzas and a large Moorish style cathedral, it was a delightful place to explore. Unfortunately, we were too late for lunch, many places stop serving lunch at 3 PM and yes that’s the church bells chiming 3’0clock, but there was a fabulous deli nearby. So we ended up, like two old dears, munching away on delicious paninis filled with cheese, salamis and roasted veggies, sitting on a bench staring out to sea. But the sun sets earlier in January and we still had one more place to visit before heading home over the mountain back to Naples. Just a 15 minute drive away, our final stop of the day, Ravello. Now we loved Positano, liked Amalfi even more but fell in love with Ravello. 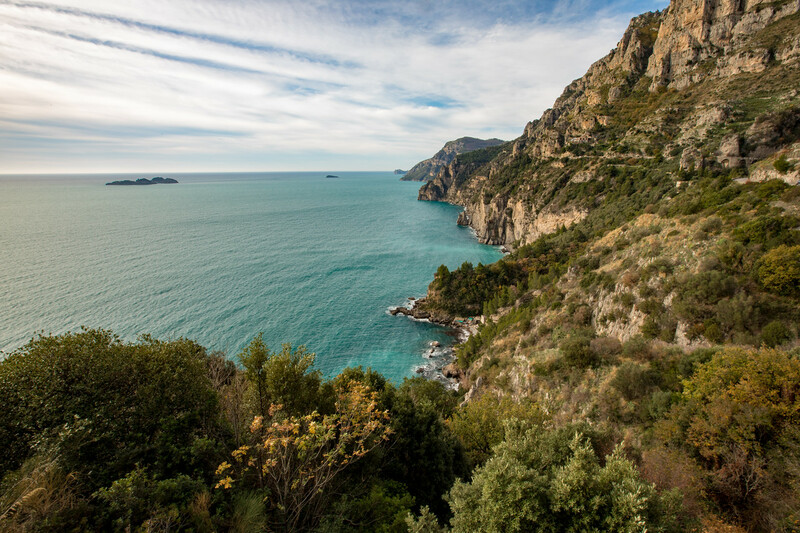 Yep, if we ever get the chance to go driving the Amalfi Coast, this is where we would base ourselves. It’s a beautiful mountain village, with panoramic views of the sea, medieval churches, piazzas and ancient stone alleyways. Jon and I looked at each other, umm maybe we could live here for ten months and rent the villa out for the summer months! But the sun was starting to set, it was time to return to our base in Naples. Self-drive: Not for the faint-hearted but an experience. Buses: Bus company SITA runs buses along the coast. Ferries: Ferries connect the main resorts along the coast and can be much quicker than the buses. Note: many of the ferry routes only operate during the summer months. 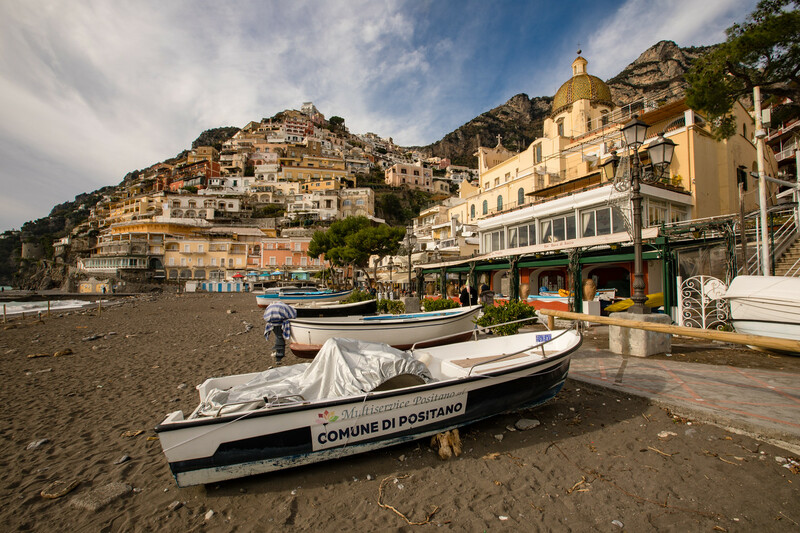 For example, from Positano, the first ferry of the season started end of March. Start early, there’s a lot to see in just one day. If possible, stay an extra day or more. If you are driving, make sure your hotel or guest house has a car park. Parking can be difficult. Buy oranges along the way. Stop often to savour the view. We’re heading back to the Amalfi Coast in a few weeks’ time. Looking forward to it. One of the achievements I boast about the most at a dinner party is that a few years back when travelling with the kids we had rented a station wagon to use in Italy. 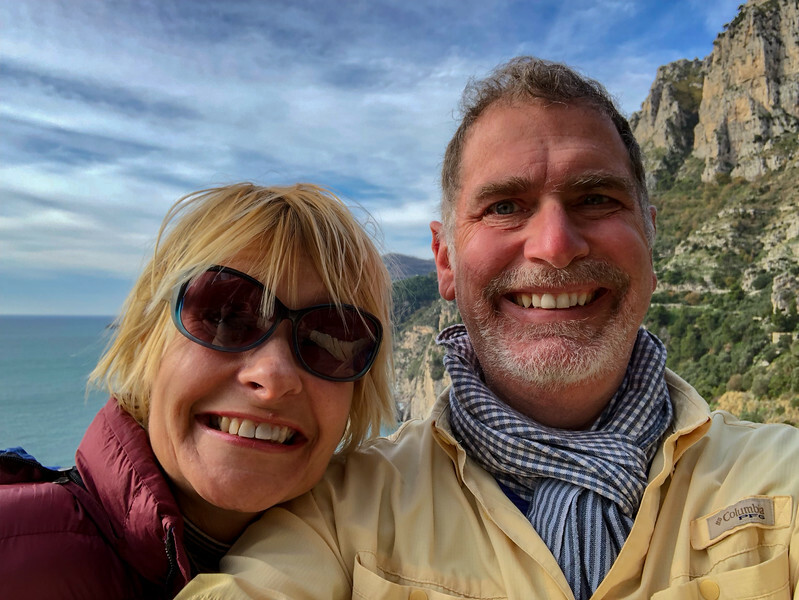 It was great for most of the time but when we were on the Amalfi Coast the roads were so narrow at times the parking assist alarms went off each time we drove down certain roads but I didn’t scratch it once! And the traffic in summer is an experience – especially if caught behind a bus.